Professional XLR line and .25" Mic/Instrument inputs, with loop through. Applications : PRX512M is the most compact and versatile speaker in the PRX500 Series. It has been designed to deliver the most performance for its weight and size as both a stage monitor and a front of house main PA. Two user selectable EQ settings are provided to optimize the system for either application. With a dual socket pole mount the PRX512M is a perfect match with a PRX518S subwoofer, offering a high performance self-powered sub/sat system. The PRX512M is a self-powered, lightweight two-way multipurpose loudspeaker system. The PRX512M is comprised of a 262F 305 mm (12") Differential Drive� woofer, a 2408H 37.5 mm (1.5 in) annular polymer diaphragm, neodymium compression driver mounted to a 70� by 70� horn, all driven by a multichannel Crown International Class-D digital power amplifier. A propriety DSP chip is at the core of a fully featured input section, providing user selectable system EQ, protection, input sensitivity selection, crossover functionality, dynamic limiting and discrete component optimization. 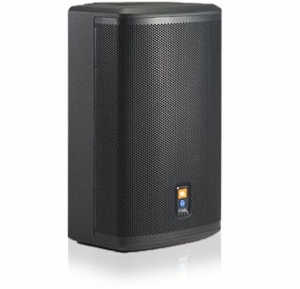 The enclosure is constructed of quality plywood and coated in JBL�s rugged DuraFlex� finish. An integrated dual angle pole mount on the bottom enables easy deployment and aiming. The CNC-machined steel grille wraps around the sides of the enclosure so there are no protruding lips on the front of the box to create acoustical interference. The grille is also lined with an acoustically transparent foam to provide additional driver protection. The amplifier input panel offers XLR or � inch jack compatibility and a sensitivity switch provides extra flexibility, making it possible to connect literally any sound source without using a mixer. Signal present and overload lights indicate the system status and assist in setting the optimum level, via the level control knob.